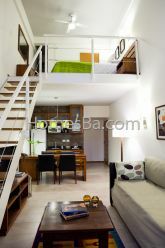 Lovely apartment in San Telmo with bilingual Consierge service and tourist assistance to customers. Loft type apartment with two bathrooms in suite, air conditionig, and heating, safety box, private balcony, and a large common terrace with charcoal barbecue. Double glassed windows, complete kitchinette with full kitchenware and utensils, microwave, coffe maker, toaster and fridge with freezer, Tv. LCD 32", DVD. Sommier Queen Size in bedroom upstairs, sofa-bed for two downstairs. The sommier Queen Size can be changed --if available, please ask before-- by two twins. Weekly maid with change of linin and towells. PLEASE CHECK RENTAL FEES. THEY CHANGE ACCORDINGLY TO 2/3/4 PASSENGERS. PUBLISHED RATES IS FOR 2 PEOPLE.